Commercial boxes of Christmas crackers are often very pricey, but you can make your own from paper napkins and pretty embellishments. 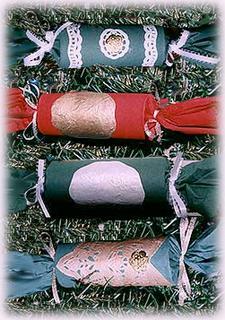 Insert a cracker snap (if you’re using one), plus a small gift into the tissue roll. Roll tissue roll inside a colored paper napkin, as shown heret, and secure the end with a dot of craft glue. Cut each end of the roll with pinking sheers or decorative edge scissors, to a length that will keep your cracker to a total of about ten to twelve inches long. Twist the ends of the cracker gently, being careful not to tear the napkin as you work. Tie a piece of ribbon around each end to secure the twist in place. There are photos of four different crackers shown above and all are just paper doily pieces glued to the napkin. I cut the centers of some doilies and painted them with either gold or pearl white paint and once the paint dried, I glued the pieces to the cracker. I also cut small pieces and edges from doilies to create some. Experiment with different cutouts of paper doilies and simply glue them to the cracker.